I need a very small, highly compact osteoporosis model to take with me on rounds. What options are available? A 4 stage osteoporosis model that is designed to be just four inches in diameter is the perfect option for easy portability. 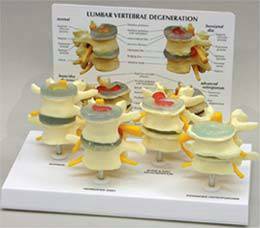 This model, is made of a series of discs that swing out to show a healthy, stage two, three and four cross section of bone and is just what is needed for easy transport. The benefit of these models is that they don't require one specific joint be affected, rather they highlight the changes in the bone itself. For use with a wide range of different patients and different health issues this is really a highly compact, very simple yet detailed tool for a medical professional to use. In working with patients with bone loss problems I have tried videos and charts and would like to try an osteoporosis model. Which model is the most comprehensive? Depending on the specific location of the osteoporosis, there are several different models that highlight the progressive degeneration of the bone that occurs with the condition. The very small and highly compact disc model is perfect for any condition, but it is not three dimensional in nature. 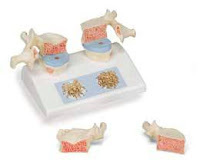 For an anatomical model that is in three dimensions you may want to consider a four stage vertebrae model or an osteoarthritis four stage knee model. This is a very comprehensive model that shows an exact yet slightly smaller version of the particular joint from every angle. The specific damaged done by osteoporosis, arthritis and other degenerative diseases is clearly visible by looking at the model. Combining a model with other types of information for the patient is highly effective. Continue using videos, pictures and written information along with the model. Each patient will use the information in different forms and will remember different presentations. Having a wide range of options can really help increase understanding. Is there any osteoporosis model that shows the specific damage to the structure of the bone caused by the disease? All high quality osteoporosis model options will show the specific damage to the bone, joint and surrounding tissues caused by the condition. Some models are very specific and highlight other features that can occur with the disease. For example the model of the spine will include marked bone compression as well as bone spurs. However having the other models also showing other spinal conditions can help in generating conversation and clearing up any misunderstanding about the diagnosis or the treatment. Why is an osteoporosis model helpful in talking to an elderly patient? Elderly patients may have difficult in hearing, comprehending and retaining information given to them about a specific type of diagnosis or treatment. Using an osteoporosis model to help the patient see what you are talking about is essential in ensuring that the patient is informed and knowledgeable about the condition. Not only can anatomy models be very effective with the elderly patient, but the spouse, caregiver, and family can also benefit from seeing the model and having a better understanding of the health condition.